[7 March, 2016, Singapore] – Rolling around in handbags with keys and coins, smartphones get put through their paces day after day – drops, scratches, bumps and bruises. Smartphone cases have become necessary not only to keep phones safe, but also as an accessory to show off status and style. Now, OtterBox – known for its ultra-robust and protective smartphone cases announce serious protection with all of the glamour - Symmetry Series – Crystal Edition for iPhone 6/6s embellished with crystals from Swarovski. Exclusive to Asia and custom-designed for iPhone 6/6s, Symmetry Series - Crystal Edition is adorned with genuine Swarovski fine rock crystalsand packs as much protection as it does sparkle. Made with raised edges and dual-material for the utmost protection, the case will absorb the shock and resist the scratches. And if you thought putting the major protection on meant major hassle and putting your manicure at risk – think again. The case is super easy to install and will stylise your phone in a flash. Wondering how Swarovski fine rock crystals can stand up against the bumps and shocks of your daily dramas? The new case has OtterBox Certified Drop+ Protection – which means it has been put through 24+ tests and 238+ hours of rigorous testing including a Hand Lotion and Makeup Resistance Test, Jeans Pocket Test and even a Sweat Test, for those extra busy days! Crystal Edition comes in the following colours: gold sand crystal, midnight crystal and mystic crystal. The Crystal Edition will retail for SGD$229. For lovers of all things leather, OtterBox is also introducing two new business-meeting-ready cases. The Symmetry Series - Leather Edition is handcrafted with genuine leather to offer a unique, high-end luxury product without sacrificing that all-important protection smartphones need. And for those who aren’t prepared to give up that flipbook obsession just yet, Strada Series for iPhone 6 Plus/6s Plus features a book-style cover in fashionable Italian design. It closes securely around the device or can be folded into a hands-free viewing stand. 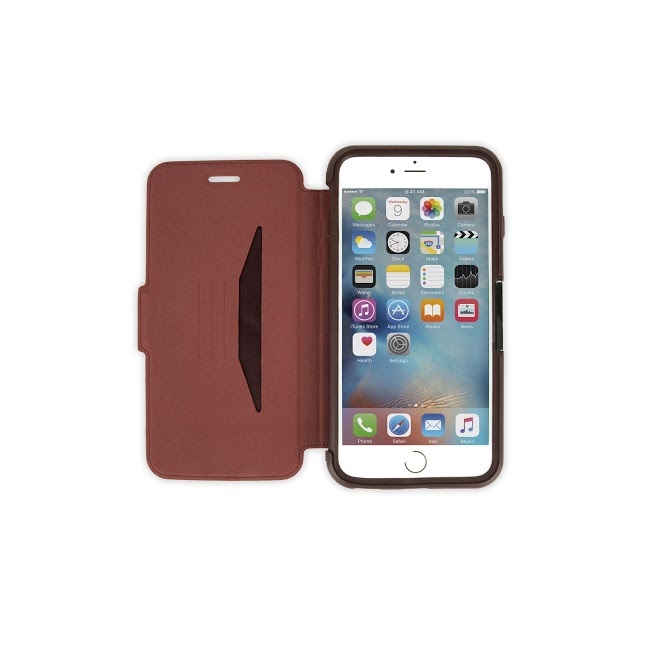 When the folio opens, a convenient card slot and an extra vertical pocket make it easy to store cards or cash. The Leather Edition comes in the following colours: midnight black, cobalt blue, antique tan and magenta pink. The Leather Edition will retail for SGD$99 for iPhone 6/6s and SGD$129 for iPhone 6/6s Plus. Strada Series for iPhone 6 Plus/6s Plus comes in the following colors: burgundy, tan and black. Strada Series will retail for SGD$99. Starting in 1998 with a line of dry boxes, OtterBox has evolved into the No. 1-selling case for smartphones in the U.S. and a global leader in mobile device protection. *Its diverse lineup of protective solutions for smartphone and tablet devices is the result of precision engineering, diligent testing and continual technological advancement, giving technology users the confidence to make the most of their mobile world. OtterBox is an eight-time honoree on the Inc. 5000 list of fastest growing private companies in the U.S. and was named one of "America's Most Promising Companies" by Forbes Magazine. The company is headquartered in Fort Collins, Colo., with offices in San Diego; Boston; Cork, Ireland; and Hong Kong. Swarovski is the premium brand for the finest crystal embellishments since 1895. It is recognised for its innovative excellence and its collaborations with top-class designers and brands in the fashion, jewelry, accessories, interior design, and lighting industries across the globe. Swarovski®’ Seal, which serves as a certificate of authenticity that identifies products made with genuine Swarovski crystals.